With only 9 weeks of language training, he boarded a plane and arrived in a new country where he would live for 2 years. Learning a language is tiring! John says it took him about a year and a half to feel comfortable with Lithuanian – a language that is very different from English and spoken only in that country. 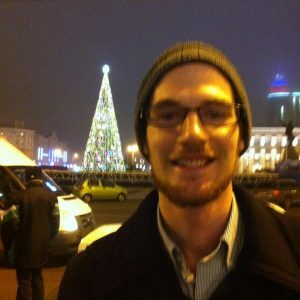 Being a nerd (his own words), he took on the challenge and devoted a great deal of his time to practicing and learning how Lithuanian grammar works. Finding people in the country, native speakers and other missionaries, helped John learn and feel comfortable with the language. It opened doors for him to learn more about the culture and his experiences with people there. Another language from the Balto-Slavic group, Russian is a cousin language and was the next language challenge John took on when he returned to finish his undergraduate studies in the US. Similarities in grammar and some vocabulary helped put this new language into context and gave John a small advantage in his Russian classes. Like Lithuanian, Russian has more cases than English and require speakers to modify nouns when speaking. Unlike Lithuanian, learning Russian was a tactical and strategic decision for John. He started looking for international internships while a student and found a position in a small town in Russian working with the International Language Program. 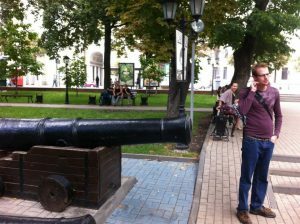 John went to Voronezh, Russia, lived with a host family, and spent a few months teaching English and practice Russian in an immersive environment. His favorite language partner was the daughter of his host family, who not only was a beautiful Russian woman but also spoke very little English so they could only communicate in Russian. 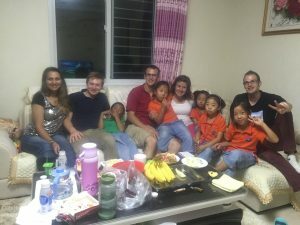 John’s next international internship position took him to China as a leader in the ILP teaching program there. With very little Chinese, he moved to a small town and spent a great deal of time and effort trying to learn a new language. Another strategic move, John speaks about this experience as challenging for many reasons but rewarding all the same. For someone who is not a self-proclaimed language nerd, he has had many diverse experiences with different languages. Part of language is learning to mimic accents and phrases from native speakers. John finds wonder and excitement in learning new things, new ways of thinking about things, and new ways of communicating One thing is certain: when John commits to learning languages, he spends a lot of time practicing and studying the language. Being a language nerd is very difficult but finding wonder in what you devote your time to makes it more worthwhile.